CrowdMed is an online platform that connects patients with difficult medical conditions to a medical community that uses its collective intelligence to find the right diagnosis. When a patient has a rare condition or non-specific symptoms, getting an accurate diagnosis can be a costly process that takes months or even years. CrowdMed harnesses the combined savvy of more than 20,000 doctors, nurses, medical students, and others to offer suggestions that patients can then bring to their doctors in-person to help expedite the time to find a correct diagnosis. Launched in 2013, CrowdMed has already helped more than 2,000 patients get closer to finding the right diagnosis. not only verified medical professionals like physicians, psychologists, and dentists, but also people who’ve struggled with illness themselves and healthcare aficionados. 72% of the medical specialists work in or study medicine and represent 11 countries. Then, in an online chatroom and through correspondence with the patient, the medical detectives collaborate to come up with diagnoses. Every case is moderated by a licensed physician. 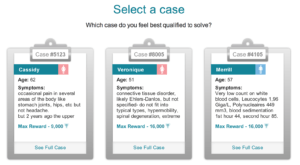 Next, taking into account each detective’s previous successes with diagnoses, CrowdMed’s proprietary algorithm predicts how accurate their suggestions are likely to be and ranks the suggestions. Finally, the patient receives a detailed report containing the highest-ranked suggestions, which he / she takes to their doctor in-person. Liability issues are sidestepped because patients are not officially diagnosed or treated – suggestions generated must be independently verified by the patient with a doctor in-person. How is value created and captured? How are participants incentivized? CrowdMed creates value for all its stakeholders – patients, medical detectives, and the healthcare system. 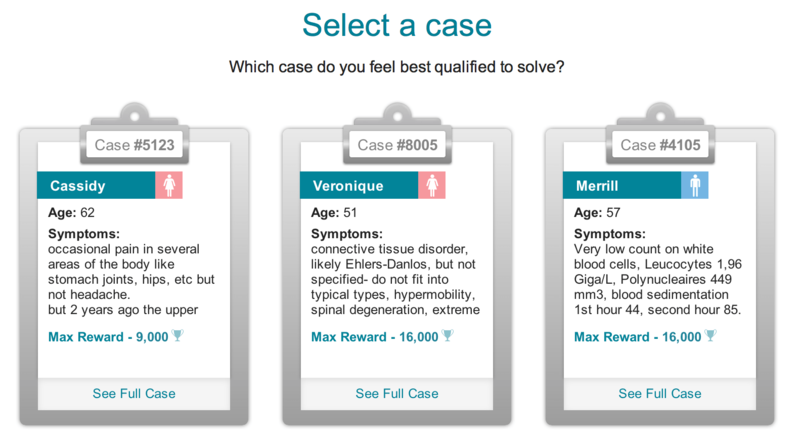 Research shows that 75% of the time, CrowdMed’s detectives get a person’s diagnosis right. Using the site also results in 28% lesser medical costs, 32% fewer trips to specialists, and 45% fewer high-cost medical procedures. 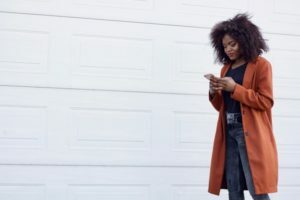 Another study found that after CrowdMed detectives resolved a case, the number of patient healthcare visits by dropped by nearly 50% and their average medical costs went down by about $200 per month. Therefore, patients are incentivized to participate by offering what will hopefully be the right diagnosis, faster, and with lower overall healthcare costs. Finally, for CrowdMed, revenue comes from the subscription fees that patients pay per month to list their cases on the platform and 10% commission of the cash rewards that patients pay to the medical detectives who got the diagnosis right. Patients pay fees of up to $749 per month (Standard $149/month, Premium $299/month, and Elite $749/month) to list their case – higher fees buy higher-ranked detectives working on the case. CrowdMed’s biggest challenge is getting providers to take their diagnoses seriously. 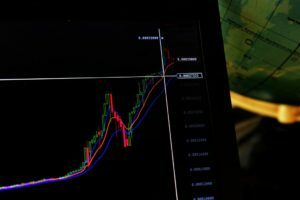 The patient can face resistance from providers to accept or even discuss CrowdMed’s output, making the patient’s efforts and money spent in vain. While a second or a third opinion can help a patient find a receptive provider, CrowdMed should market its past successes more to build credibility with providers. 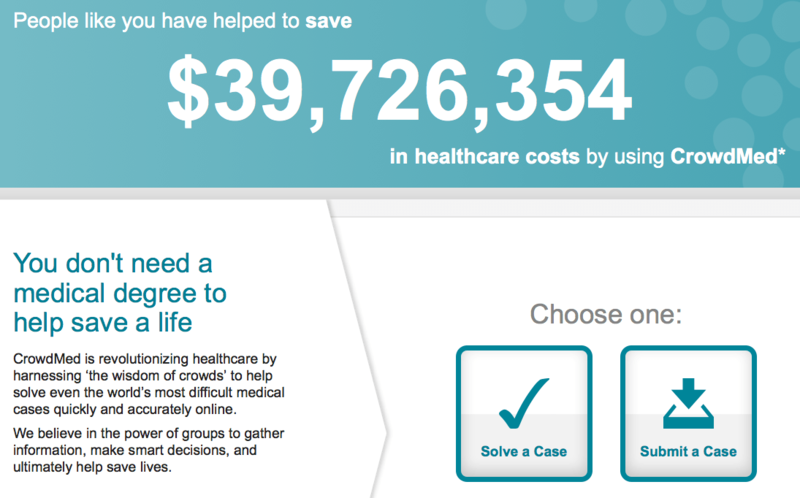 CrowdMed’s largest growth opportunity lies with insurers. Given that its model lowers overall healthcare costs, it is of immense value for insurers, who can choose to reimburse for a CrowdMed analysis for those patients who are finding it hard to get diagnosed. 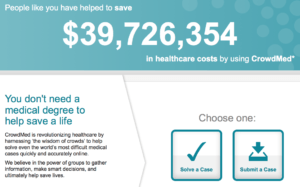 CrowdMed currently has pilot programs underway with four insurance firms to explore this. I personally hope that CrowdMed succeeds – if we can profitably leverage the collective intelligence of crowds to solve medical problems and lower healthcare costs, the world would be a better place. Next Submission	Friendsurance: Friends with Benefits? Very interesting model! It sounds almost like Quora for medical experts. I’m actually curious about the viability of the subscription service. For example, what is to prevent a patient from dropping out of the platform once the doctors have diagnosed their problems? It’s also interesting to think about the moral implications of segmenting the quality of the doctors by how much the patient is able to pay. I think this pricing works great for other markets, but just seems a little “icky” in this situation. However, I do think that this is a great platform for younger, inexperienced doctors to “practice” by learning how to diagnose real life situations. It would be extremely helpful if learnings can be disseminated from each solved patient case so that other doctors can learn and improve. This can then be another source of revenue, which are hospitals or medical schools who want to better train their doctors in a cost effective way. Saurav, thanks for sharing. I share Cyou’s concerns regarding the payment tiers and the problem of diagnosed subscribers leaving the platform (along with their revenue), but I am sure that profit model would change if they partnered with an insurance provider. I also wonder if CrowdMed is leveraging the data it is collecting to build algorithms that could assist with diagnosis. I also see the “tele-med” models that some hospitals are experimenting with as a direct competitor. I wonder if Crowdmed partnered with a hospital or only allowed M.D.s and P.A.s to diagnose, if that would improve the perception of legitimacy in the eyes of patients and insurance providers. I’m excited to see where this goes.